I am trying to rewire our bedroom so that a wall switch that turns on/off a receptacle will instead control a ceiling light and leave the receptacle always hot. 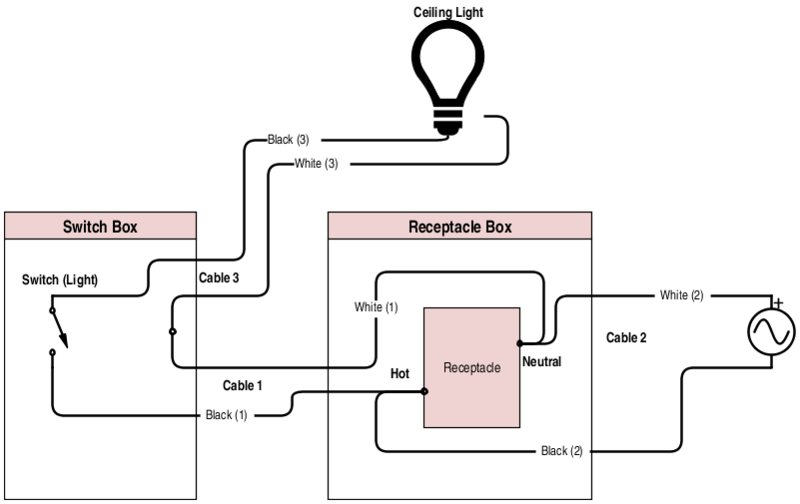 Receptacle: Has 2 cables coming into the box. The black wire of cable one is connected to the outlet. The white of cable two is connected to the outlet. The white wire of cable one and the black wire of cable two are connected together with a wire nut. Switch: Has a 2 conductor cable coming into the switch box. I have installed the light fixture in the ceiling and have run a 2 conductor cable in the attic from the light fixture to the switch. At this point I am confused as to complete the wiring of the switch and the receptacle. Any help would be greatly appreciated. Thanks. Thank you all for your answers. I was able to successfully get the switch to control the light. First turn off the circuit at the breaker panel. A good practice is to confirm that there is no power on any cables in boxes you are working on using a non-contact tester. If the switch only has one 2 conductor cable in its box, it is a switch loop. That means the power from the mains comes to the switched fixture box (in your case, the outlet) and only the hot wire is routed to the switch. The other wire in the switch cable is a switched hot (even though it is probably white or white with a black marking) which carries power back to the switched outlet. What you need to do is to convert that switched hot to a neutral. First you need to determine which wire is always hot. Usually that would be the black wire, but you need to be sure. At the outlet box see which wire from the switch is attached to the black wire from the mains. If it is black, leave it connected. If not, disconnect it and connect the black switch wire to the black mains wire. Then connect the white switch wire to the white mains wire. You will also need to connect the hot side of the outlet to the black mains wire (you will have already removed one of the switch wires from the hot side of the switched outlet). Now you have an always hot outlet and a full circuit going to the switch box. At the switch box, attach the white wire from the outlet box cable (now a neutral) to the white wire going to the light fixture. Attach the black wire from the outlet box cable to the switch (hot) and the black wire from the fixture to the other side of the switch (switched hot). At the light fixture, black to black, white to white. We did not mention grounds, but they should all be connected in each box and to the switches and fixtures, using pigtails if needed. These are extra pieces of wire that you attach to the wire bundles to tie the fixtures or switches into the ground lines. You will need to confirm the wiring yourself using a multimeter. Not the answer you're looking for? Browse other questions tagged switch rewire receptacle or ask your own question. How do I add a switch/closet light to the existing end line light switch? Can I make a switched outlet which is connected to light hot all the time without running new wire?